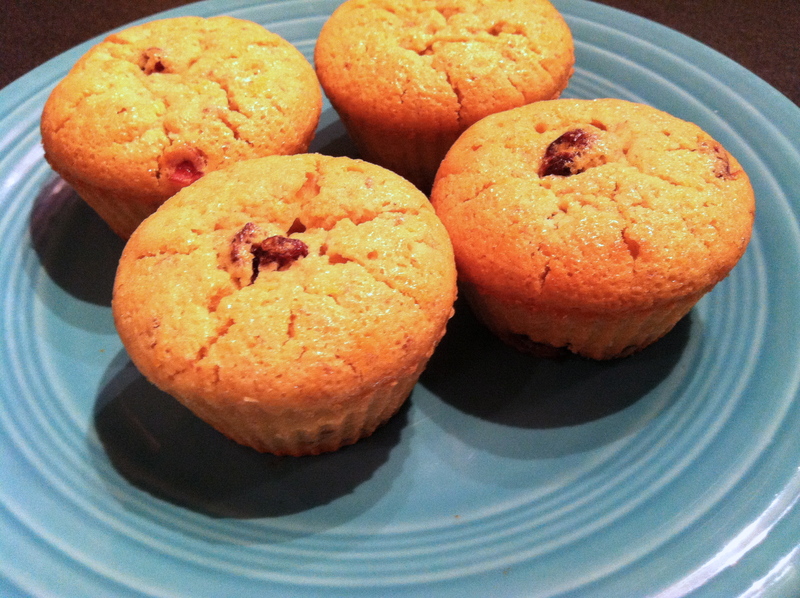 I found these muffins over on www.egglesscooking.com and decided to try them gluten-free. They turned out great! Easy recipe. No mixer necessary. Prep time is about 10-15 minutes and in less than an hour from start to finish you’re enjoying warm, fluffy muffins. Enjoy! 1. Preheat oven to 375 degrees. Grease or line your oven tin or use silicone baking cups — my favorite — and set on a baking sheet. 2. In a large bowl, mix together flour, sugar, baking powder, salt and nuts, if using. 3. In a smaller bowl, whisk the flax and water until it is frothy. Add orange zest. 4. Add orange juice to a one-cup measuring cup. Fill the rest with water. Add to wet mixture, along with the oil. 5. Pour the liquid mixture into the dry and combine or whisk until just mixed. Fold in cranberries. If you’re using frozen cranberries, don’t thaw first — just chop and fold. If you thaw first, it will turn the batter pink (unless you’re into that kind of thing). Oh — because fresh and frozen cranberries weren’t available, I used dried cranberries, but I probably used closer to 1/2 c. which was plenty. 6. Bake for 30 minutes. The original recipe says 20-22 minutes, but I found them to still be a little dense and gooey in the middle. I found closer to 30 to be perfect inside and out. Be careful — it’s hard to eat just one!